If you have normal or dry skin, day to day environmental stresses can dehydrate skin, leaving it feeling dry and dull. 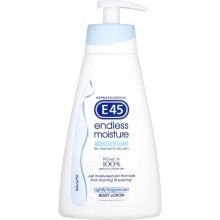 E45 Endless Moisture Light Caring Body Milk provides long-lasting moisture & protection from water loss, meaning your skin is as moisturised in the evening as when you applied the product in the morning. It has been developed with dermatologists to be lightweight, quickly absorbed and non-greasy. E45 Endless Moisture's unique Constant Moisture Build formulation contains a complex of natural lipid & glycerine that work in harmony with your skin to replenish lost moisture, then build & maintain hydration in the skin for at least 24 hours. Your skin feels velvety soft & moisturised all day long. 200ml and 400ml creams available in lightly fragranced or 100% perfume and color free. This is a great all round moisturiser and my husband readily uses it too. It is a no good, frills product that works well and lasts well. My daughter has used this,she has eczema and finds thisa very nourishing and non irritable. Not as thick as I would have liked, but it does the job well. Not great and absorbs really well. Has a very faint scent. Great for all of the family. Fantastic cream its easy to use pump means its so convenient to sit by the sink or bath. Iv'e been using this all over but I must say I keep one near my kitchen sink as I'm forever washing up though out the day which means my hands do get dried out a lot, But this has made a dramatic difference to the appearance of my hands around my nails and cuticles and they are so so soft. Its a great buy! Very good body cream its really hydrating and highly moisturizing.